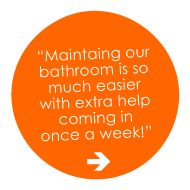 We’re the cleaning services of Edgewater NJ. We send out trusted individuals who have each passed an extensive background check and have been thoroughly trained for the tasks at hand. With the best staff and very competitive rates, Maid in Hoboken> can quickly make your life a little easier. Our team is happy to take cleaning off of your hands entirely, from sweeping and mopping to changing light bulbs and cleaning the ceilings. On a tight budget? Our services don’t have to be scheduled regularly in Edgewater, NJ. Let us cover the ‘Big Cleans’ a few times a year while you take care of the maintenance in between. We can tweak all services to suit your needs. We’re here for you, so please reach out to us anytime.